From Nikolaus Geyrhalter, the director of OUR DAILY BREAD, comes this IDFA Special Jury Award-winning documentary, an epic journey to twelve remote and rarely glimpsed locales and communities around the world. Geyerhalter films expansive vistas of desert, snow, jungle, ice, and rainforest, travels with a scooter-riding Finnish reindeer herdsman, visits the home of a Namibian couple with relational problems, ventures out to sea with a Sardinian fisherman. In observational and striking visual portraits, impressions of modernization's influence on traditional societies emerge. 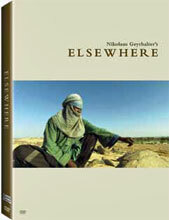 An homage to humanity, ELSEWHERE is a nuanced portrait of life - fragile and resilient - at the start of the 21st century. Homo Sapiens: Abandoned landscapes of urban decay portend an ominous future in this wordless documentary.